Awarded a national seal of distinction for three years running, Emory's WorkLife programs are helping people reach their potential -- both at work and in life. "Close your eyes and imagine you are driving on a freeway at night in the worst possible conditions — bad lighting, blinding rain, heavy traffic, wipers not working properly, and worst of all, a nervous back-seat driver who insists on blasting the weather report at full volume. An 18-wheeler passes on the left, sending a wave of water across the windshield, prompting the passenger to scream and grab your sleeve. "Tell me what that feels like," says nursing professor Ken Hepburn to participants in this session on caregiving. "Imagine living in a universe where the stimuli are so raw and frequent." Beyond sharing strategies for taking care of loved ones with dementia, Hepburn wants these participants from the Emory community to understand the losses that come with dementia, both in thinking and feeling. Each time he makes this presentation, several people stay behind. "Their questions are not trivial," he says. "They are wrestling with big issues." 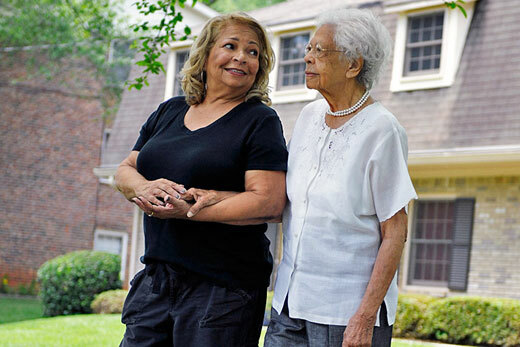 Supporting members of the Emory community with these caregiving and other work-life issues is part of the mission of the Emory WorkLife Resource Center. In 2006, President James Wagner commissioned the Work-Life Initiative Task Force to participate in the cross-cutting strategic theme, Creating Community and Engaging Society. This theme arose from Emory's desire to be a destination place to work, recognizing that to meet that goal, the university needed to be provide support to faculty and staff for not only work but also raising families in a supportive community environment.